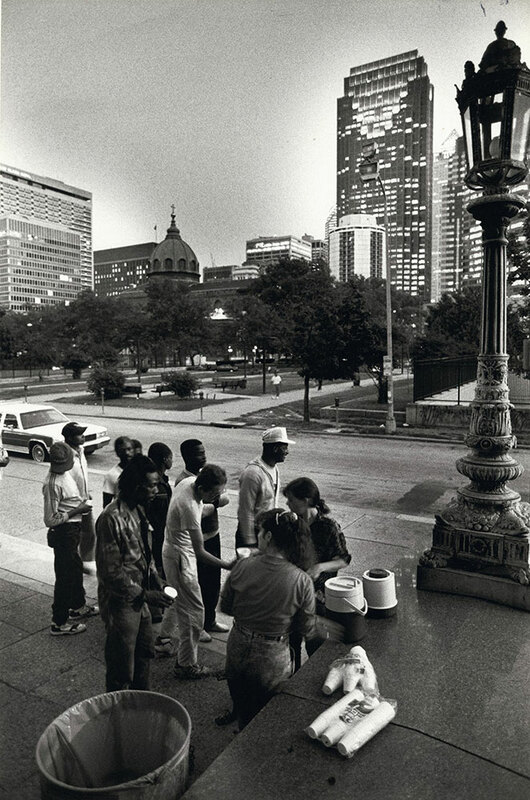 The text for this 1983 photograph, taken by Philadelphia Inquirer photographer Gerald S. Williams, is from the Philadelphia Inquirer's description: Volunteers, "all of Perkasie area (not part of any group), came down to pass out sandwiches and coffee to homeless in front of 1801 Vine. 'Trevors' groups had been stopped from giving out food here a couple of months ago, by the city." The photo was taken from the steps of the Municipal Court Building; the cupola of the Cathedral Basilica of SS Peter and Paul can be seen in the background.